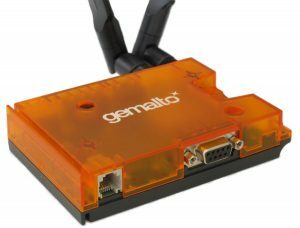 Gemalto's new Cinterion® 4G/LTE Cat-1 Smart Terminal with Serial and USB interfaces provides implementers with a single solution for Global M2M and IoT deployments on 4G/LTE networks. The PLS62T-W-USB Modem-Terminal is a simple and reliable plug-and-play communications device with standard Serial and USB connections. Customer specific features can be implemented via optional embedded Java™ applications which have access to additional GPIO interface signals via specific connectors. PLS62T-W-USB requires very little integration and approval efforts, as it operates on LTE/4G Cat-1 networks with automatic fall-back to 3G & 2G networks globally. It has full type approval (FTA) and certification by the largest carriers worldwide, and is ready for secure reliable industrial connectivity applications anywhere in the world. 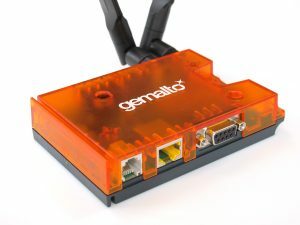 Gemalto's new Cinterion® 4G/LTE Cat-1 Smart Terminal with Ethernet LAN interface provides implementers with a competitive edge in M2M and IoT deployments. The ELS61T-LAN LTE Cat-1 Terminal Gateway is a simple and reliable plug-and-play communications device with LAN connection supporting Power over Ethernet (PoE) as an option. Customer specific features can be implemented via optional embedded Java™ applications with access to the complete suite of GPIO interfaces. ELS61T-LAN requires very little integration and approval efforts, is supplied as a regionally optimised LTE device with appropriate fall-back to 2G or 3G support. It has full type approval (FTA) and certification by the largest carriers worldwide, and is ready for secure reliable industrial connectivity applications anywhere in the world. 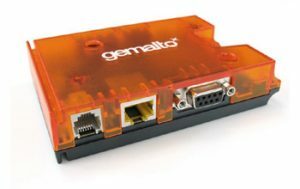 Gemalto's latest Cinterion® 3G Smart Terminal is a simple and reliable plug-and-play communications device allowing M2M developers to quickly create industrial applications using cellular wireless technology. With very little integration and approval efforts, the EHS6T-USB provides a cost effective, fast-to-market solution for both small volume and large enterprise optimisation project alike. The device is equally suitable as a communications Modem managed via Serial or USB interface or as a stand-alone solution controlled by an embedded Java™ application with access to the complete suite of GPIO interfaces. With five-band HSPA+ baseband, full type approval (FTA) and certification by the largest carriers worldwide, the device is ready for secure reliable industrial connectivity applications anywhere in the world. The latest Cinterion® 3G Smart Terminal with Ethernet LAN interface gives implementers the competitive edge in M2M and IoT deployments. The EHS6T-LAN 3G Cellular Terminal Gateway is a simple and reliable plug-and-play communications device with LAN connection supporting Power over Ethernet (PoE) as an option. To further simplify project roll-outs the device is pre-loaded with a comprehensive list of APNs. Additional customer specific features can be implemented via option embedded Java™ applications with access to the complete suite of GPIO interfaces. EHS6T-LAN requires very little integration and approval efforts, and with five-band HSPA+, full type approval (FTA) and certification by the largest carriers worldwide, the device is ready for secure reliable industrial connectivity applications anywhere in the world. Gemalto's ultra-compact Cinterion® BGS2T Terminal / Modem is a simple and reliable plug-and-play Cellular communications device with either a Serial RS232 or RS485 interface. Both versions feature Quad-Band GSM/GPRS baseband, TCP/IP connectivity based on GPRS class 10 data transmission and very low power consumption. Ideal for first time M2M implementers and small scale deployments, the BGS2 Terminal offers reliable, cost-effective, out-of-the-box M2M communications for a variety of industrial applications such as metering, security, transportation, remote monitoring and control and many more. The slim design Modem Terminal shares the footprint of a credit card, and easily fits in almost every M2M application. To ensure a simple, reliable and efficient integration the ultra-compact design incorporates a highly flexible mounting concept. Flexible mounting concept - DIN Rail, Screw Fixing, C-Rail, Cable Tie Locations. 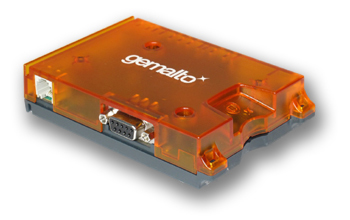 Gemalto's latest Cinterion® 2G Smart Terminal takes M2M simplicity to a whole new level. Leveraging the latest Java embedded technology, the plug-and-play BGS5T is powered by a quad-band GPRS baseband delivering cost optimised, secure TCP/IP connectivity anywhere in the world. 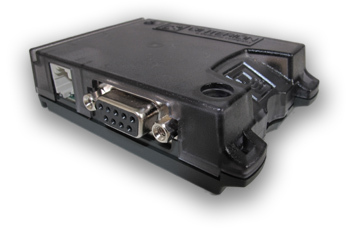 The BGS5T includes universal USB and RS232 industrial interfaces and is encased in a compact, rugged housing. With very little integration and approval efforts, the BGS5T is a fast-to-market solution for both small volume and large enterprises wishing to take advantage of I-o-T applications. 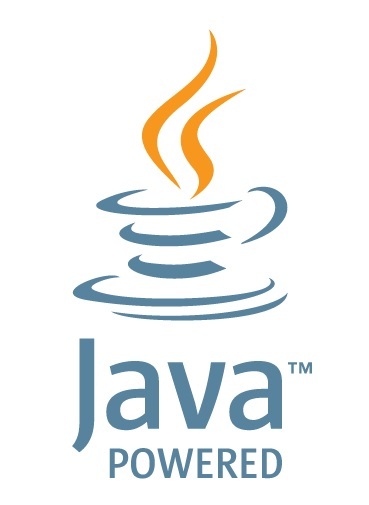 The embedded Java™ platform offers easy application development with access to GPIO interfaces, Secure data transmission with HTTPS/SSL and large internal memory resources. BGS5T carries full type approval (FTA) and certification by the largest carriers worldwide, the device is ready for secure reliable industrial connectivity applications anywhere in the world. 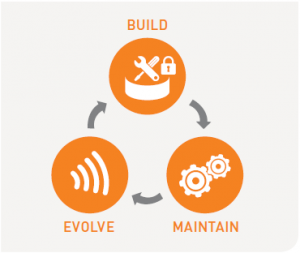 Module Services are a set of remote management tools for Cinterion M2M Modules & Modem-Terminals that help diagnose hardware and connectivity issues, and proactively manage the life-cycle of embedded applications and firmware. This helps reduce the overall cost of operations and keep your assets secure no matter where they are in the world. The service depends upon a small application, 'the SensorLogic Agent', running on the wireless module inside the Gemalto Java enabled Terminals. It is effortless to activate the service by AT Command. 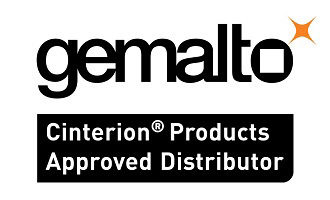 The software agent then establishes and maintains a secure link to the cloud back-end powered by Gemalto. The solution is fully and reliably hosted by Gemalto. 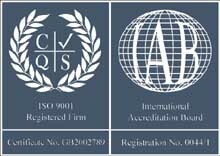 Hosting services fully comply with all common standards such as ISO-27001 and SSAE-16 Type 2. 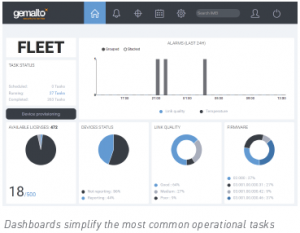 For specific requirements regarding uptime SLA and server availability, Gemalto are able to help directly. The service is available as a flexible pay-as-you-grow model. A free trial is available.